I started reading The Dollmaker of Kraków not knowing what to expect. I finished it wondering why more people weren’t talking about it. Once upon a time, there was a doll named Karolina. Karolina lived in the Land of the Dolls where magic works, although not always how you’d imagine. When rats overthrow the Land of the Dolls’ king and queen, Karolina finds herself forced to do the vermin’s bidding. Karolina fins a way to escape, though, and is swept away by a strange wind that transports her to WWII Kraków, Poland. Karolina isn’t dropped in just any place, though. Instead, she finds herself in a toyshop under the care of the Dollmaker, who has a haunted past and a hidden magic. The Dollmaker is a solitary man, but Karolina’s curiosity and courage inspire him to look beyond his shop. The Dollmaker and Karolina befriend a violin-playing father and his daughter who — once they get over the shock of a talking doll — become as dear as family. For the first time in a long time, the Dollmaker knows happiness. If only that happiness could last. Just as things are becoming comfortable, the Nazis invade Poland, and it doesn’t take long to figure out everything the Dollmaker and Karolina hold dear could come crumbling down in an instant. Though called The Dollmaker of Kraków, the third-person narrative follows Karolina instead. And her story in the Land of Dolls unfolds parallel to that of the Dollmaker. This parallel existence helps scale what’s going on to a personal level as well as big picture. Karolina might be one of my favorite characters to come out of middle grade fiction this year. Her traits often made me think of her as a child rather than a doll. She is curious and yet she knows injustice and feels deeply. Though she looks delicate, she’s strong and fiercely loyal. And she understands more than people seem to think. The Dollmaker of Kraków works because there’s a blend of hope with sadness. Author R. M. Romero finds happiness and light among the darkest of times. Her balance of all these elements is inspired. 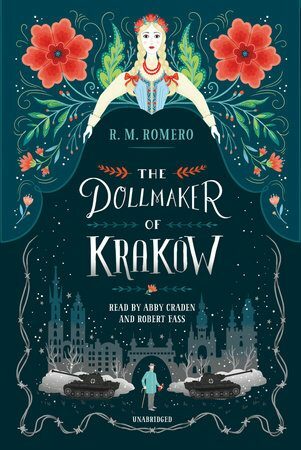 I highly recommend The Dollmaker of Kraków for readers young and old. © 2017, Cracking the Cover. All rights reserved.